For the millions who love David Pogue's irresistible tech tips—people who have followed his advice from the-New York Times, NOVA, and CBS Sunday Morning, to Yahoo, Twitter, and beyond. Did you know that you can dry out your wet cell phone by putting its parts in separate bowls of uncooked rice? That you can scroll through a website using only your spacebar? That if you type your airline and flight number in to Google, it tells you where your flight is, the gate, terminal, and how long until it lands? When David Pogue gave this kind of advice in the New York Times, his columns were consistently the most e-mailed of the week. When he gave a TED Talk of his tips, 1.3 million people watched it in the first 90 days. Pogue's tips have earned him 1.5 million followers on Twitter. And now that he writes his columns for Yahoo Tech, the audience for this advice has grown by millions more. Here at last is the book all these fans have been waiting for: a book of 200 tips that will change your relation-ship to your phone, computer, tablet, camera—all of the technology in your life. A layflat format makes this the perfect reference book that you can turn to time and time again to pick up more helpful cheats for all your devices. 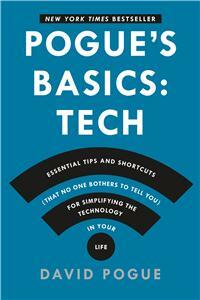 At last, you can lose the nagging, insecure feeling that you're not the master of your own gadg-ets; the tech tips in Pogue's Basics are all you need to get by...the shortcuts to a happier technological life. DAVID POGUE is the author of the New York Times bestseller, Pogue's Basics: Tech. He has 1.5 million follow-ers on Twitter, has given four TED talks, and launched Yahoo Tech. For thirteen years, he wrote for The New York Times and also writes a monthly column for Scientific American, created the Missing Manual computer-book series, hosts science shows on PBS's NOVA, and appears frequently on CBS Sunday Morning. He has won two Emmys, two Webby awards, and a Loeb award for journalism.